How lane departure warning systems work and why correct operation is vital by Pro-Align’s Paul Beaurain. Vehicles have become increasingly complex in recent years and the introduction of sophisticated driver assistance systems such as Adaptive Cruise Control (ACC) or Lane Departure Warning (LDW) have undoubtedly made motoring safer for drivers. However, for technicians servicing the vehicles, the systems can also present a host of challenges, which if not tackled correctly, can inhibit or reduce the accuracy and operation of the systems. Still a relatively niche safety system, although one which is being fitted on an increasing number of vehicles, LDW uses a form of radar or laser to look forward and detect the lines on the road. Once activated, if the driver starts to wander across the carriageway or deviate from their path, they are alerted via a variety of methods, such as a dashboard light or vibrating steering wheel. As the cameras on the LDW system look forward, its correct operation is related to the thrust line of the vehicle – (the thrust line is the angle of direction the rear wheels point in relation to the vehicle’s centre line. If the two are not matched, the car will ‘crab’, or move sideways from the rear). Therefore it’s essential for the correct operation of the LDW system that the system’s camera is properly calibrated and matched to the vehicle’s geometry whenever changes are made. With LDW, there are two main potential issues related to the thrust line that technicians may encounter. Firstly, any changes made to the angle of the LDW camera can make a significant difference to the system. This can potentially occur when repairs are made to the front end of the vehicle, such as when a replacement bumper or windscreen is fitted, as this is where cameras are frequently housed. 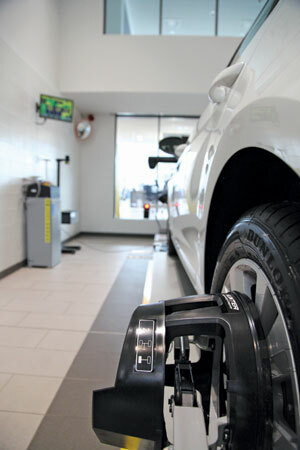 The second potential issue occurs when alterations are made to the car’s alignment settings. If changes are made and the LDW system is not recalibrated, again, this may cause potential errors. While these challenges and the systems themselves are relatively complex, ensuring the correct operation of the Lane Departure Warning system is relatively straightforward. Regardless of which of the two changes listed earlier are made to the vehicle, it is essential that the camera is recalibrated and aligned to the vehicle. This operation needs to be carried out using a suitable diagnostic tool and a designated board which “extends” the vehicle. However, as this step is often overlooked or forgotten by many technicians, the latest Hunter alignment systems include software which ensure the issue is addressed. When inputting the vehicle data at the start of an alignment check, the Hunter system will ask the technician if the vehicle is fitted with systems such as LDW, ACC or ESP. For more information on the advanced software capabilities of the Hunter alignment systems, visit www.hunter.com.